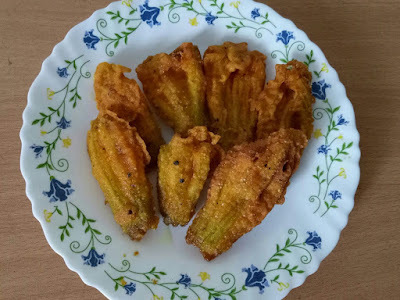 are in rainy season and yes rainy day is the best and ideal time for making and eating such type of pakora/deep fried things . 1. 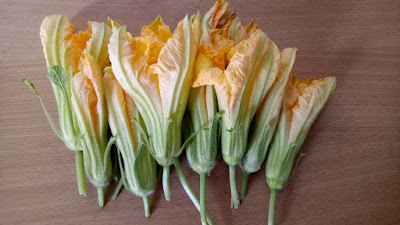 Pumkin flower - 8 pcs. 2. Besan - 5 tablespoon. 3. Salt - as per test. 4. Turmeric powder - one pinch. 5. Black peper powder - 1 tea spoon. 6. Baking soda - one pinch. 7. Water - half cup. 8. Sunflower oil - 3 cup. In a mixing bowl take all ingridient and make a smooth batter . Take sunflower oil in a kadai and on the gas flame . Dip the flower in the batter and put into the hot oil , fry until it's get a golden brown color. Take on a tissue paper , so the extra oil from the pakora can soked the paper. And yea... finally the Pumkin flower pakora is ready to surve ...enjoy With tomato sauce . It's not only tasty it has a number of health benifits . It has vitamin - A, C, calcium, potacium ,and magnecium. Also very low in saturated fat and cholesterol . So if you think it's a informative blog . And if you like the blog please let us know by your precious comment. And don't forget to share the blog with your friends.